Feeding Cats Fish - Is It A Good Idea? We frequently see cartoons showing cats eating fish. Indeed, cats do seem to love fish. 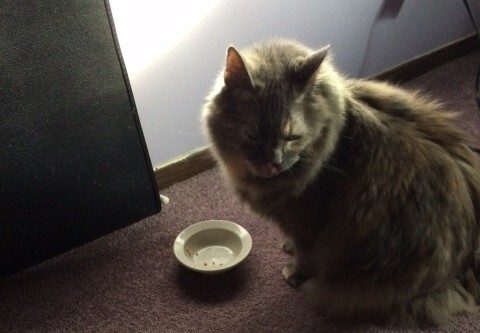 We feed our cats a little bit of fish with their raw food diets and they love it. Even so, is feeding cats fish a good idea for more than an occasional treat? According to Dr. Michael Fox, the answer is an emphatic NO! What’s wrong with feeding cats fish? Fish contains certain enzymes that destroy thiamine in cats. Thiamine is a necessary B vitamin for their metabolism. Without it, they begin exhibiting neurological issues, such as bending or curling their necks, head tilt, circling, and even seizures. They may also start vomiting more. House cats are descended from desert-dwelling species of cats, most likely the African wildcat. That cat’s natural prey is rodents, rabbits, and maybe reptiles. Not fish. While fish is great as an occasional treat for cats, feeding them a diet primarily of fish can make them very sick. Additionally, commercial cat foods made with fish tend to contain higher levels of magnesium and phosphorus than is safe for your cat. These things can be issues for cats with a history of urinary problems. Phosphorus is a major problem for cats with kidney disease. Cats eating primarily commercial cat food made of fish can be at a higher risk for UTIs and crystals. Dr. Jean Hofve, DVM, has a list of reasons why fish-based cat foods are bad for your cat. To read the article in full, click here. Beyond all that, fish can be contaminated with unsafe levels of heavy metals. This is a problem even in human food, so it’s likely even more of an issue for cats. This food also contains a preservative known as ethoxyquin, which is banned from human consumption. Why feed your cat something that’s so unsafe for you it’s been banned? So in general, it’s best to avoid feeding cats fish products altogether. Whether it’s commercial cat food or raw fish, feeding it as more than a very occasional treat can be harmful for your cat. It’s best to stick with foods that are closer to their natural prey, such as poultry.